The Labrador retriever has so much fun during the big day - or maybe he just needed a tummy rub? An Illinois couple’s dog stole the show during his owner’s wedding with his joyful reaction to their nuptial. Angie Blumberg married Jayce Conway at Rainbow Ranch Lodge in Big Sky, Montana, on July 28, NBC affiliate WFLA reported. The couple grew up in the same town and have been best friends since preschool. According to WFLA, their friendship evolved into more over the years and they started dating five years ago. When they were planning their wedding, the couple knew they wanted to included their dog Boone, a 6-year-old Labrador Retriever, in the ceremony. 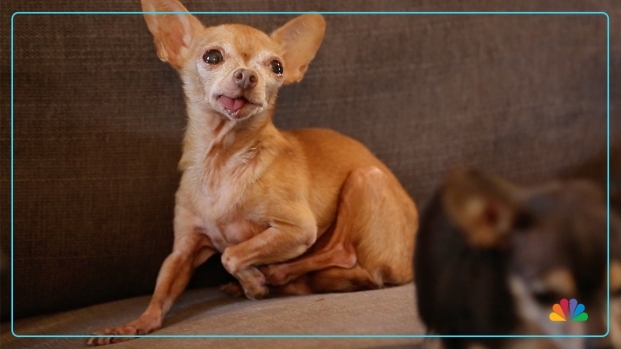 Rescue-pet-turned-Instagram-star Mervin the Chihuahua and dog dad Joey Teixeira share why adoption is their first option, along with some tips on how to make your pet a social media celebrity. Blumberg told WJW-TV that during the ceremony’s opening prayer, Boone began rolling around on the grass in front of them. A photo captured by the couple’s wedding photographer shows Boone on his back with his legs in the air and pure jubilation on his face. And while it may not be the wedding photo these newlyweds frame, it is definitely one that has captured the internet. The photo has been shared by hundreds of thousands on social media. "It was totally Boone's day! I'm happy with that!" Blumberg replied to a comment on a Facebook post.